Belvita Breakfast back on TV! Belvita Breakfast, the UK’s number one breakfast biscuit, is back on the box with a brand new advert. Belvita Breakfast, the UK’s number one breakfast biscuit1, is back on the box with a brand new advert. Featuring top radio presenter, Lisa Snowdon, the campaign celebrates the ‘little wins’ in life, especially the challenges a morning can throw at you. With one in three people regularly skipping breakfast in the UK2 it shows that Belvita Breakfast can easily fit into a busy schedule. The TV advertisement is part of our year-long marketing campaign, which includes the brands six month sponsorship of Capital Radio Breakfast Shows. Belvita Breakfast has set itself aside from competitors by being the only breakfast biscuit clinically proven to slowly release carbohydrates over four hours as part of a balanced breakfast3. It has revolutionised the biscuit category, and its success suggests that consumers are really buying into the idea of a biscuit as part of a balanced breakfast. We’re continuing to support Belvita throughout 2014, so make sure you’ve stocked up. Do you know? 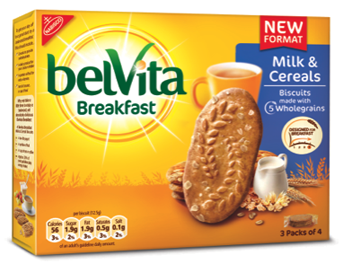 Belvita Breakfast was launched in the UK in 2010, creating and leading a new breakfast biscuit category in the UK. Belvita Breakfast was launched in the UK in 2010, creating and leading a new breakfast biscuit category in the UK. It is now the number one breakfast biscuit brand, worth £50 million1. To help you capitalise on this growing brand, we’ve launched an exclusive pack format for the convenience channel. The new 150g top up packs are available in Belvita’s top selling flavours, Milk & Cereals and Honey & Nut, each containing three 50g packs of the delicious crunchy biscuits. Priced at £1.49(RRP*),our Belvita Breakfast biscuit 150g packs are available in both standard and price-marked packs and are available in depots now!